Single parenting two teens on the Autism Spectrum. It is time to get back into the blogging routine. Both teen sons are now in high school. Matthew turned 15 this past June and Nicholas turns 17 in March. Since Dec 1st of 2010 Matthew has been funded by the State of California through the Regional Center for Applied Behavior Analysis (ABA), which was for the behavior of putting holes in the walls (last count it was 21) with his pounding on the wall as he walked by. Life skills are also part of the therapy - teach tooth brushing and toilet training. We have four nights a week for 2.5 hrs. One therapist for three nights and another therapist for one night. I will post another blog on the revolving door of therapists and supervisors we have had in less than one year. Another blog post will be on how Matthew went from being a poor picky eater to now consuming everything in sight, similar to a typical teenager. Toilet training is a slow process but will be covered in a blog as well. Matthew's teacher has an adult son in a group home - this was the selling point for me for this high school and class - which is a CBI - Community Based Instruction with MRS students - Mental Retardation Severe. His two elective classes are JROTC - his uniform is sharp and I am waiting for the day he has to wear it to school so I can take a picture. His class is after lunch so might have him change his shirt with his aide prior to lunch. The other elective class is drawing. I met the teacher at back to school night, where he mentioned his son has PDD. The bus that takes Matt and his aide to school also goes to another High school. On the bus are two students that Matthew went to elementary school with and they were all in the same Kindergarten. One of the aides was also in the First grade class Nicholas attended. The good news is that LAUSD starts school three weeks earlier next year. They get out still at the end of June. There was one incident with Matthew getting out of the house via the backdoor when I was at the gym one Saturday and their Father was here watching them. A neighbor spotted Matthew coming out of the gate and dashing around the corner. She knocked on the door and had the Dad drive his car down the hill to catch up to Matthew - who was running in his socks down the middle of the street. After learning of this escape and the first of its kind, I stopped going out on weekends and the Dad just comes for a quick visit on Sundays. I am not sure where Matthew was going - but he was on pure adrenaline. The neighbor ran all the way down to find him until the car got to him. The lake that we used to walk laps around is being drained and under construction for two years so we found a park that is closer and Matthew enjoys walking at a fast pace around and it is filled with trees and shade. Nicholas is still doing online schooling - taking Biology, Spanish, Modern World Studies, Literature and some other courses. There are some online clubs he is enjoying. I think I will send him to a camp next summer to work on social, life and community skills. This is a nice update. Glad to hear about your sons. Will Nick be staying in HS a little longer until he is 21, or does he have other plans? Nick is higher functioning and on the diploma track. I did hold himk back in first grade, so he will be 19 when he graduates. Matt will be in high school until he is 22. Thanks for asking. I've really enjoyed reading through this blog. Thanks for sharing your experience with all of us! You are such a good parent! I am so proud of all that you do. Good update...I feel as if I know a bit more about you and your family's journey! And, welcome back to blogging. Nice to see you writing again. Great update on your sons. Wish we lived close to each other. What a super update. I have one suggestion -- a link somewhere on the site that explains what autism actually is. It's great to know what you're up to and your family adventures. You're a great parent. Thanks for the insightful tips and updates. Glad to hear of the good progress on your family and some of the positive changes. Keep up the good work! Great update about your sons! 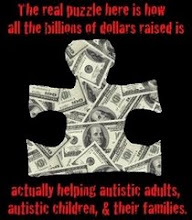 thank you for your contribution to helping raise awareness about autism. I look forward to reading your next post. Not many realize that this is a lifetime commitment for the parents. Good to hear that your sons are doing well. So glad to see you diving into blogging again. It can be therapeutic for you. Thanks for the update about your sons. Looking forward to more updates going forward and the chance to look back and read what you wrote a few years ago when you were still blogging. Thank you Bonnie, for 'letting me in' and allowing me to understand your life a bit better. I respect you for your loving commitment and I'm glad you're all doing well. Keep up the blogging Bonnie:). thanks for the welcome back to blogging. This is a wonderful blog thanks for sharing your experiences. I am doing some research on behalf of a non-profit camp and ran across your story. I got sucked in and kept reading then realized you may look into sending your son to a camp. Just wanted to let you know, although far away from where you live, Meadowood Springs has a camp that sounds perfect for your son. If at all interested, check out their site at http://meadowoodsprings.org - they have people come from surrounding states to attend their camp and they have some incredible testimonials from families. Thanks and good luck to you and your family. Eek. We have a runaway too - also in socks. I'd hoped that phase was over, but vigilance is the only answer around here. All the best for 2012. It was great to find another single mother parenting teens. My boys are 12 and 13 and both have Aspergers diagnoses with different manifestations of the spectrum. Your blog is inspiring. I hope you'll check out my new venture with another Aspie mom at http://www.abilityparenting.com. My daughter suffered from autism for more than 2 years which we started experiencing in her when she turned 1 year and 5 months we all thought it will end but got even worse as days went by. We tried all several treatments and therapy prescribed by various doctors we met but to no avail, she lost total concentration and always complain of sensitivity to sound . She usually tells me she haves poor eyes contact. This were steady disorder that disrupted her entire life, even at night she slept less because of this.It was during a casual conversation with a friend that i learned about Dr Williams herbal medicine I was able to contact him on his email address. and give him all the necessary information that he needed,few day later he sent me the herbal portion and his medicine was able to restore her back to normal and she is very okay now without any side effects whatsoever.if you are also experiencing this ailment, do not hesitate to contact him on autismepilepsy.blogspot.com for advice and for his product. I hope this also helps someone out there. Thanks for visiting. Feel free to contact me through yahoo or gmail at autismfamily dot com. We are happy to review items geared to the autism community or that may benefit those on the spectrum. My sons are ages 19 and 20.